Protein homeostasis, or proteostasis, is required for proper cell function and thus must be under tight maintenance in all circumstances. In crowded cell conditions, protein folding is sometimes unfavorable, and this condition is worsened during stress situations. Cells cope with such stress through the use of a Protein Quality Control system, which uses molecular chaperones and heat shock proteins as its major players. This system aids with folding, avoiding misfolding and/or reversing aggregation. A pivotal regulator of the response to heat stress is Heat Shock Factor, which is recruited to the promoters of the chaperone genes, inducting their expression. This mini review aims to cover our general knowledge on the structure and function of this factor. Keywords: Heat shock protein, homeostasis, catalysis, molecular chaperones, protein folding and misfolding, heat shock factor. Keywords:Heat shock protein, homeostasis, catalysis, molecular chaperones, protein folding and misfolding, heat shock factor. Abstract:Protein homeostasis, or proteostasis, is required for proper cell function and thus must be under tight maintenance in all circumstances. In crowded cell conditions, protein folding is sometimes unfavorable, and this condition is worsened during stress situations. Cells cope with such stress through the use of a Protein Quality Control system, which uses molecular chaperones and heat shock proteins as its major players. This system aids with folding, avoiding misfolding and/or reversing aggregation. 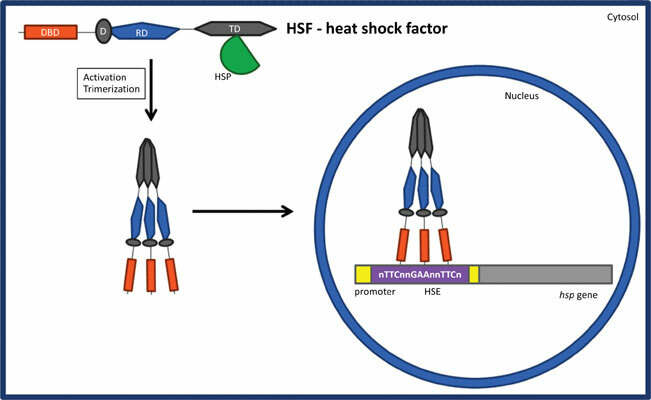 A pivotal regulator of the response to heat stress is Heat Shock Factor, which is recruited to the promoters of the chaperone genes, inducting their expression. This mini review aims to cover our general knowledge on the structure and function of this factor.